Located 7 km from the centre of Cannes, the 4-star Mercure Cannes Mandelieu is ideal for both a family stay and business seminars. You will enjoy its green surroundings and its proximity to the main attractions of Cannes. Its facilities will meet all your expectations: swimming pool, family rooms, large terrace for dining, meeting rooms with all modern conveniences, everything is there for work and to relax and discover Cannes. 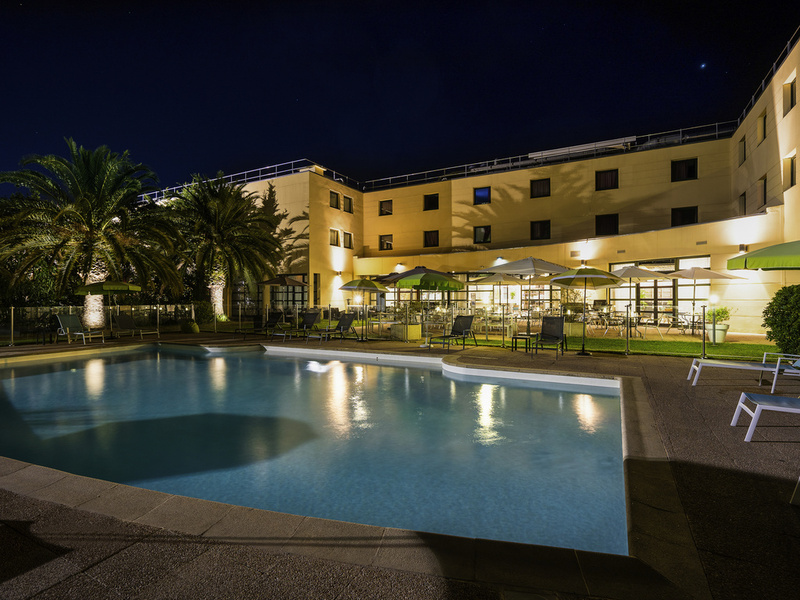 Located 300 metres from the beach and 7 km from the town centre, Mercure Cannes Mandelieu is ideal for exploring Cannes and its fine sand beaches. Use the free shuttle service from the hotel for easy access to your conference in Cannes. Our rooms are spacious and comfortable; choose between a Standard Room and a Privilege Room, offering a wider range of services. Our chef's menu changes with the seasons, blending Provençal colors, tastes and flavors. Air-conditioned room; terrace with views of the pool and the Esterel mountains. Open daily from May 1 to September 30. Closed at weekends from October 1 to April 30. Enjoy a refreshing drink on the poolside terrace or a nice glass from our wine cellar with flavors selected by Bettane and Desseauve. One night business trip. Hotel was clean and my room was large and modern however colleagues on first floor was yet to be reburbished and looked tired so try and get a second floor room. Breakfast was adequate buffet style. Location is good for nearby commercial/ Cannes Airport but no good if you want a room view of the beach. However 5 min walk and you are on the coast. Next to many other negatives, the most memorable (negatively and physically) was that I got about 20 bits of bed bugs!!! Clean, good sized room with decent wifi connection. Dinner was reasonably priced considering the location, and good fayre too. Ought to have been better selection of soaps / shower gel in the room. But a minor criticism. Nice hotel, clean rooms, great staff. One of the better in-hotel restaurants with good breakfast and menu for lunch & dinner. The restaurant was very good (service and food) and staff at frontdesk very friendly and helpful. The rooms are a bit aged, but still OK.
A comfortable and clean and relaxing place to stay. It ticked all the boxes! The room was large comfortable and clean. I appreciated that. The staff on reception were efficient and welcoming. The staff in the restaurant and bar area were very helpful and added to the positive experience of my stay in the hotel. The main meal I had in the restaurant was exceptional. Special thanks to the kitchen! The only thing that proved a challenge was breakfast. It took a little working out where everything was. Took me a long time to get settled and find what I wanted. Not sure why this was. A colleague of mine also had the same problem. The layout was not intuitive I guess. But a very small point, we would have got the hang of it if we have stayed longer. Had a welcome reception on arrival. Clean and pleasant room. Restaurant food good, Unfortunately head waiter not friendly at all. Swift check out. Would stay again and hope the head waiter had been replaced. Excellent service by all employees. Very friendly and supportive at all times. It is illegal to force pre-payment beyond the price of the room. All ok but no more than that. The hotel is a little worn down. The most uncomfortable bed I have ever slept in.